The Haven Spa & Hotel: a modern luxurious boutique mountain retreat with 8 elegant rooms, spa facilities and fully equipped gym, perfect to unwind, relax and renew your body and soul, surrounded by nature and tranquility. Still can't make up your mind? 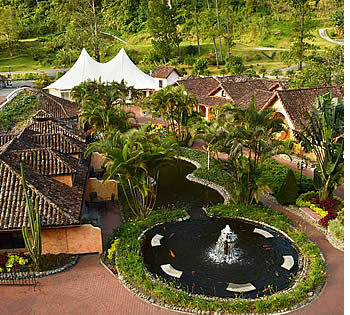 Check out this blog post about our favorite upscale lodging options in Boquete, Panama... Only Habla Ya Spanish Students are eligible for the special rates for extended stays that appear on this page when they make their reservation through us. These special rates are offered to our students due to the amount of traffic that we generate for these hotels. Most of our recommended lodging options are located within walking distance to the school (3 - 10 minutes). 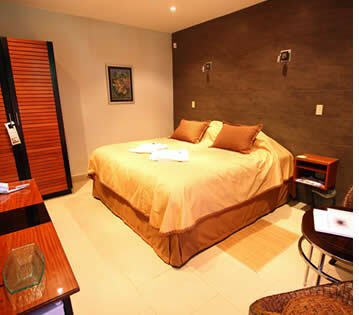 If you prefer to be just out of town, Boquete Garden Inn (5 minute taxi drive or 45 minute walk) is a great choice. The Haven is a modern luxury boutique mountain retreat with 8 elegant rooms perfect to unwind, relax and renew your body and soul, surrounded by nature and tranquility. The Haven makes you feel as if you were far away in a quiet oasis, yet you're only a 15 minute walk from Habla Ya Boquete Spanish School and Boquete's favorite restaurants, bars and shops. Here you'll be able to enjoy first class spa treatments and massages, work out in the Haven's newly equipped gym, have a splash in its indoor swimming pool, relax in the jacuzzi or infrared sauna, or just soothe your senses during your stay in one of the Haven's peaceful hotel rooms and immerse yourself in its relaxing atmosphere. The owners of the Haven Health Spa & Hotel, Sonia and Howard Jones, have more than 30 years of combined experience in the health industry. Sonia is a naturopath, nutritional therapist and reflexologist with qualifications in nutritional therapy and reflexology in Great Britain and in naturopathy in Australia. Howard Jones is a practiced acupuncturist and oversees of the management of the spa, the clinic and their own natural/organic spa skin care products. The Haven's staff also has specialists in Sports Injury, Remedial Massage, Joint Mobilization, and a Fitness Coach, as well as thoroughly trained and experienced masseuses. And finally, Priscilla Clare Nash, the manager of the Spa, will go above and beyond your expectations to make sure you get pampered and taken care of every single day, and she will make sure that you always receive the best of the best. The Garden Suite: King size bed with extra comfortable 14" mattresses, kitchenette with granite, Air-Conditioning, Flat Screen 50" LED TV, DVD Player, tea maker, coffee maker, bathroom with two sinks and separate shower & bathtub, bathrobes, outside private terrace with table and chairs, mini refrigerator/bar, safe deposit box and hairdryer. Deluxe King rooms: King Size bed with extra comfortable 14" mattress, Air-Conditioning (not that it is really necessary in Boquete), Flat Screen 32" TV, DVD Player, tea maker, coffee maker, large bathroom with two sinks, bathrobes, outside private terrace with table and chairs, mini refrigerator/bar, safe deposit box and hairdryer. Queen rooms with Kitchenette: Queen Size bed, flat screen 32" TV, DVD player, bathrobes, tea maker, coffee maker, and a microwave, mini refrigerator/bar, bathroom and hairdryer. As a guest of the Haven Spa Hotel you'll automatically have access to certain facilities such as the Gym, the Pool and the Spa. This access is included in the price of your stay. 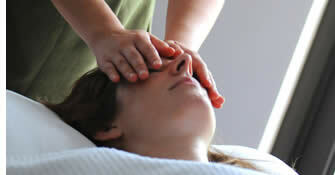 Spa treatments are offered at an extra cost. 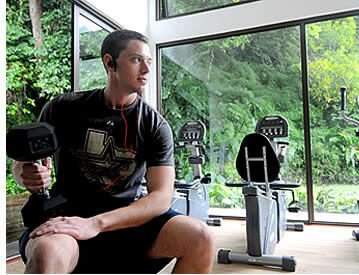 If you're not a guest at the hotel, you can also enjoy the Gym and Spa facilities of Haven Spa. You have the choice between daily, weekly, monthly and yearly memberships to the Gym and the Spa. 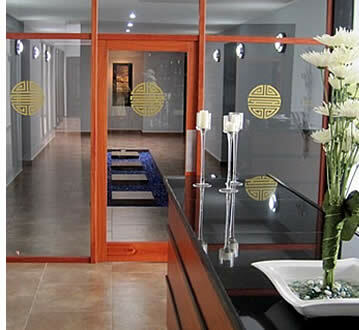 At the Haven Spa & Hotel you'll also be able to take Zumba and Yoga classes, and participate in workshops and courses about anti-ageing and health products/treatments. The clinical treatments at the Haven include acupuncture, deep tissue massages, cold laser treatments, joint and muscle work, naturopathic consultations and reflexology, arthritis and pain management programs, asthma treatments, and more. As an Habla Ya student you'll enjoy an automatic 10% discount off treatments at the Haven & Spa. At the edge of town, in a hidden valley, on the banks of a rushing river, you'll find the exclusive Valle Escondido Resort, Golf & Spa. Here you can enjoy the full service spa, play a round of golf, tennis or take advantage of its wonderful restaurants. 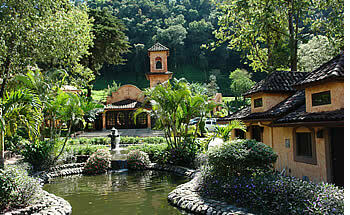 The Valle Escondido Resort, Golf & Spa has 38 rooms in total, each with its own character and design. Most have patio's overlooking the river or the beautiful ponds and gardens within the charming recreated 17th century Spanish pueblo. The main hotel, with 19 deluxe rooms, was designed to take advantage of the beautiful sights and sounds of the river. In the center of the structure are three swimming pools for children. Each of these pools are of different depths and each is accessible right from the patio. The rooms either face the river or the swimming pool. 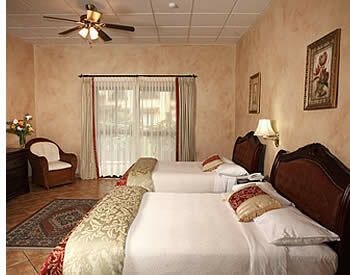 Each room has a private patio with two double beds or a king size bed. The spacious lobby has several sitting areas and a concierge service to help you with the all of the tours available in Boquete, Panama. The Fairway Bungalows (4) are like small duplex cabins with each building housing two connected rooms. Perfect for families or couples traveling together. These sit high above the #7 fairway and have great views of the golf course, valley and the pueblito. They also have large private patios and small refrigerators. Although you can park near the rooms there is a set of 20 stairs to reach the rooms. Each Fairway Bungalow has a queen sized bed. The pueblo is in the center of the valley and it is here you'll find some of Valle Escondido's most enchanting rooms: the Pueblo Bungalows (3). These rooms are each in their own building have a queen sized bed and access from the village walk. They have a private patio on the river and some have a fireplace. A small refridgerator can be added for $10 USD per night. Each building has its own character and individual amenities. A convenient feature of the Pueblo Bungalows is that they are close to everything. Valle Escondido's Riverside Bungalows (4) are large cabins on the river with large bathrooms and bathtub/showers in each. One Bungalow has a king sized bed and the rest have two queen size beds, a small kitchen area with microwave, two cooking rings, toaster, refrigerator, sink, dishes and silverware. Because of its facilities these are the bungalows that we recommend for our Spanish students wanting to stay for several weeks or traveling with children since they'll be able to prepare their own meals and sleep together comfortably. They also have large patios where you can sit and enjoy the river in total privacy. 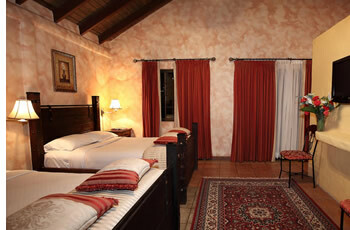 Each Junior Suite (6) localted in the Pueblo Village has its own own distinct character and amenities. Some have connecting rooms. Valle Escondido's Suites are the resort's most ample rooms with king size beds or two queen beds, and are tastefully furnished with an exquisite feel. Each room is decorated with unique pieces of dark wood and fine art. Each Junior Suite has a private patio facing the beautiful park with cascading ponds, fish, flowers and hummingbirds. 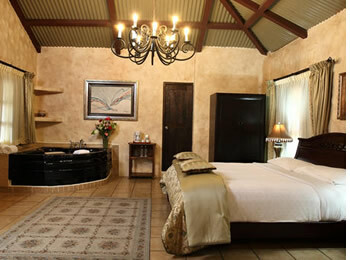 The Gardenia riverside presidential suite is a large two room suite with a Jacuzzi and LCD TV. Valle Escondido's Suites Torre and Azucena and Margarita and Chavelita join to make a spectacular suites for special occasions. You'll definitely be challenged by our 9 hole executive golf course. Imagine playing golf in Panama in air conditioned comfort. 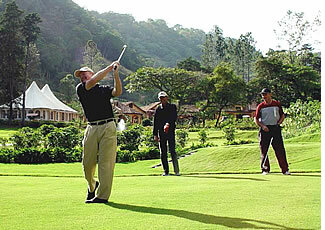 At 3,000 feet above sea level, you're in the cool mountain air and it is the only no sweat golf available in Panama. The course is not only challenging, but most people agree that it is one of the most beautiful courses in the country. You play across the Quebrada Grande river on nearly every hole. There are two tee boxes for each hole making a two round 18 hole par 60 course. Our golf shop, Tienda de Golf, offers clubs and golf carts for rent. There is a training center with driving range where you can warm up or brush up on your game. Besides all of Boquete's great restaurants, at Valle Escondido, there are two great options where you can enjoy great dining experiences. 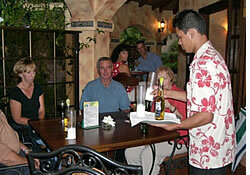 The Sabor Escondido is the perfect place to enjoy a romantic dinner or a get together with friends and family. Cozy up to the warm and inviting fireplace to enjoy a glass of special wine or your favorite cocktail. Enjoy the many flavors and textures of one-of-a-kind Latin dishes in this beautiful and romantic setting. The Sabor Escondido is reservations only, information will be given at Check-in. Dress code: Collared shirts required, no T-shirts. 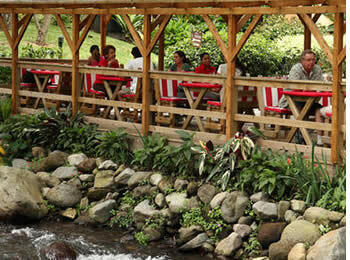 The Higueron restaurant is located on the river across from Hotel Escondido. A beautiful Higueron tree hangs out over the river and makes a perfect umbrella to shade from rain or sun. The restaurant is a great place for breakfast and lunch, serving between the hours of 7 am to 4 PM daily. The Cantina is a natural gathering place for guests and residents alike. Happy hours are scheduled weekly and you can get just about any beverage your heart desires. Enjoy a before dinner cocktail or an after dinner drink before you trod off to bed. The Cafe con Lech Coffee Shop has it all. Frappes, cappuccinos, mochas and many more coffee drinks are all here. In addition you'll find food snacks in abundance and fresh empanadas and derretidos as well as pastries. There are also several computers with internet available. Cafe con Leche is a real favorite among the guests and residents of the valley. Come and enjoy a board game or watch TV and enjoy the sights and sounds of the central park. Hours are from 7am until 6 pm everyday. From the moment you enter the Valle Escondido Health & Beauty Spa, you're transported to another time and place, one more even exotic than the one just outside our doors. To tantalize all of your senses, the Spa features displays of authentic pre-Colombian art that rival any found in the most famous museums around the world. Panama's six indigenous Indian tribes are each represented with décor that will transport you to the wilds of the jungles and serenity of the islands. Combine this ancient and current cultural history with the finest technologies the world has to offer in health and beauty, and your journey to a new level of health and wellness is about to begin. The Spa offers a variety of and healthful Spa Journeys by Pevonia including body and facial treatments, manicures, pedicures, and salon services to make you feel like royalty and bring you to a new level of awareness of your body's senses. Hotel guests have access to this wonderful facility. 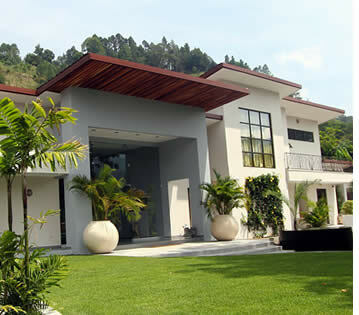 The design of the club is that of a Spanish Colonial plantation home. It includes a lap pool with a modern roof system that has been installed to allow in light and heat. The grand entrance to the facility has a large sitting area and check in desk. 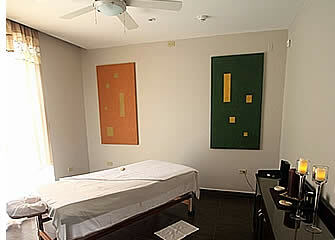 Here you can make reservations for the numerous available spa treatments and get a locker key and towels. Downstairs you'll find a racquetball court and a complete fitness center, featuring the latest in life fitness cardiovascular fitness equipment and a complete array of free weights. A large screen TV will keep your mind off your workout or you can gaze at the beautiful park outside. Minimum age limit for Country club is 14 years of age. Unique & Exclusive Panama Experiences! Spoil yourself in Boquete... Contact us!